Sirk warehouse – storage hall 25m x 60m x 6m in Ljubljana, Slovenia. Sirk warehouse – interior of the storage hall for milk and milk products. Znass warehouse – storage hall 16m x 70m x 6m in Novo mesto, Slovenia. Znass warehouse – storage hall for forklifts and their components. Renault warehouse – storage facility, 50m x 140m x 7m, with a connecting passageway and an overhead roofing in Novo mesto. Renault warehouse – storage facility, 50m x 140m x 7m, with fire and heat vents for fire safety. Renault warehouse – interior of the storage facility with smoke curtains and smoke zones. Renault warehouse – interior of the storage facility, 50m x 140m x 7m. Spedition Diehl high-racking warehouse – storage facility, 40m x 85m x 10m, near Stuttgart, Germany. Spedition Diehl high-racking warehouse – connecting overhead roofing between the new warehouse and the existing building. Spedition Diehl high-racking warehouse – storage facility with a connecting passageway towards the existing building. Spedition Diehl high-racking warehouse – interior of the storage facility, 40m x 85m x 10m. T.K.A. Intertrans warehouse – storage facility, 20m x 100m x 6m, on the eastern Polish border. T.K.A. Intertrans warehouse – interior of the storage facility, 20m x 100m x 6m. T.K.A. Intertrans warehouse – closed thermomembrane opening surface, 10m x 4m, on the front façade. T.K.A. Intertrans warehouse – open thermomembrane opening surface, 10m x 4m, on the front façade. BTC – Harvey Norman warehouse – storage facility, 40m x 60m x 7m, in Novo mesto. BTC – Harvey Norman warehouse – interior of the storage facility for furniture in Novo mesto. Krka warehouse – storage facility, 20m x 80m x 6m, in Novo mesto. Krka warehouse – interior of the storage facility for pharmaceutical products in Novo mesto. Daimler Benz warehouse – storage facility, 15m x 60m x 5m, in Kecskemét, Hungary. Pivovarna Union warehouse – interior of the storage facility, 15m x 40m x 4m, in Novo mesto. Ferosistem – Phoenix Pharma warehouses – two storage facilities for pharmaceutical products, 40m x 50m x 8m, in Beograd, Serbia. NT Bolero distribution centre – business and storage facility for beverage distribution, 40m x 60m x 8m, in Čačak, Serbia. NT Bolero distribution centre – administration block inside the facility. NT Bolero distribution centre – interior of the high-racking storage facility. Codex high-racking warehouse – storage facility, 20m x 30m x 11m, with a multi-story administration block in Murska Sobota. Codex high-racking warehouse – interior of the high-racking storage facility. DSV – Pilkington warehouse – storage facility with a production line for Pilkington windshields, 20m x 55m x 6m, in Novo mesto. DSV – Pilkington warehouse – interior of the storage facility for Pilkington windshields for cars. TPV Johnson Controls warehouse – storage facility with a combined roof (thermomembrane and panels), 25m x 30m x 6m, in Novo mesto. TPV Johnson Controls warehouse – interior of the storage facility with a combined roof. Podgorje warehouse – storage facility, 25m x 60m x 6m, in Šentjernej. Podgorje warehouse – storage facility for furniture for campers and caravans. Revoz warehouses – three identical storage facilities for car parts, each 25m x 95m x 5m, in Novo mesto. BTC warehouse – storage facility, 20m x 55m x 6m, in Novo mesto. Biomasa warehouse – storage facility, 20m x 35m x 5m, in Luče. 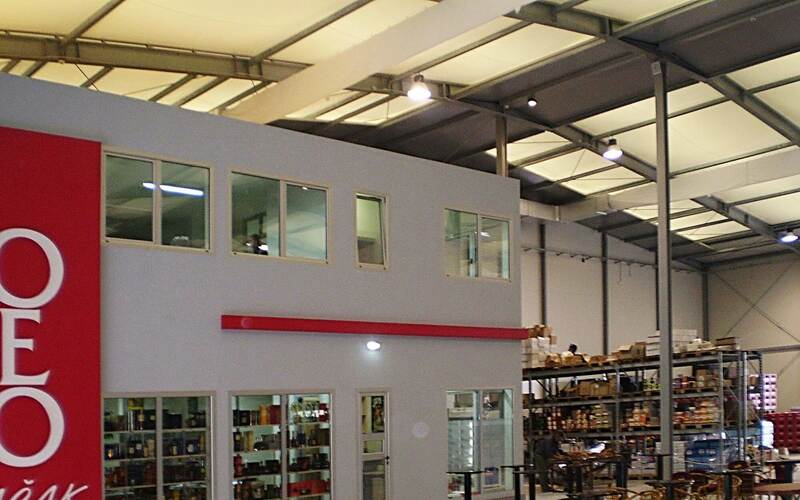 Asa Naklo warehouse – storage facility, 8m x 20m x 5m, with an overhead roofing in Naklo.